Many customers like to know about Spinning Moon Farm and the family behind the products they buy. Read on to learn about who and what goes into the products we offer. The goal of our farm is to be self sufficient. With ten acres, the land provides us hay, pasture and space to live. A centenarian barn and simple home give shelter to our animals and family. We typically have about 50 layer hens that give plenty of eggs. They are readily located in the goat or llama pens, in the barn, in the field, in the garden, in the yard, and sometimes even in the chicken pen. Our goats give us joy and a beautiful mohair crop that we harvest twice a year. The mohair is washed, cleaned, carded, and sometimes dyed for mixing with locally raised wools. We spin, knit, weave, wet felt and needle felt in our free time. To make sure we have plenty of milk for any potential bottle babies, we have Gabriela. She's our Saanen-Alpine cross dairy goat and a champion milker from our county fair. She trades us about 6 quarts of milk each day for hay, grain, fresh water, and love. I think it's a pretty good trade because she is very easy to love. Our greatest asset is our children. Without our boys helping out, we'd never get anything done. They help with chores, kidding, milking, shearing and most of all loving and playing with the goats. And we can't forget Rosie. Our fierce guard miniature Dachshund. Keeping us safe from cold laps. 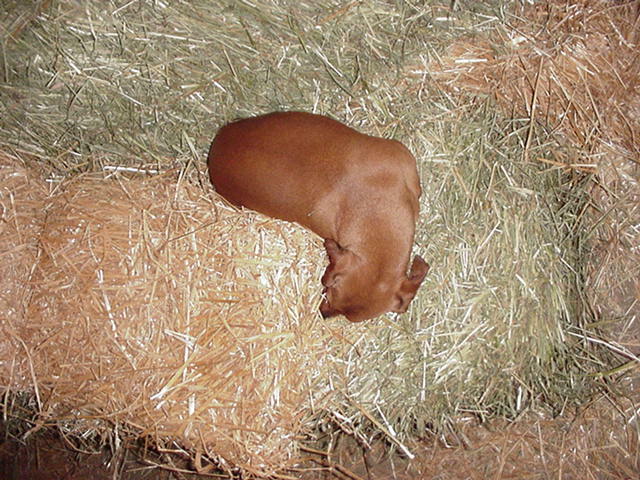 Rosie, worn out from a hard day on the farm. In memory of Rosie, one of a kind, best friend forever. We miss you every day!